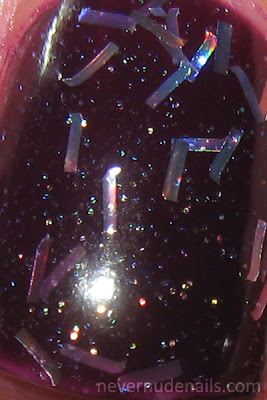 Shannon's Attitude is described by Barielle as a purple jelly with foil flakes. 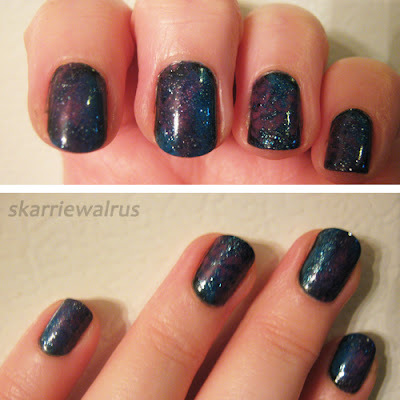 This is my first experience with bar glitters and it wasn't bad! They spread well. 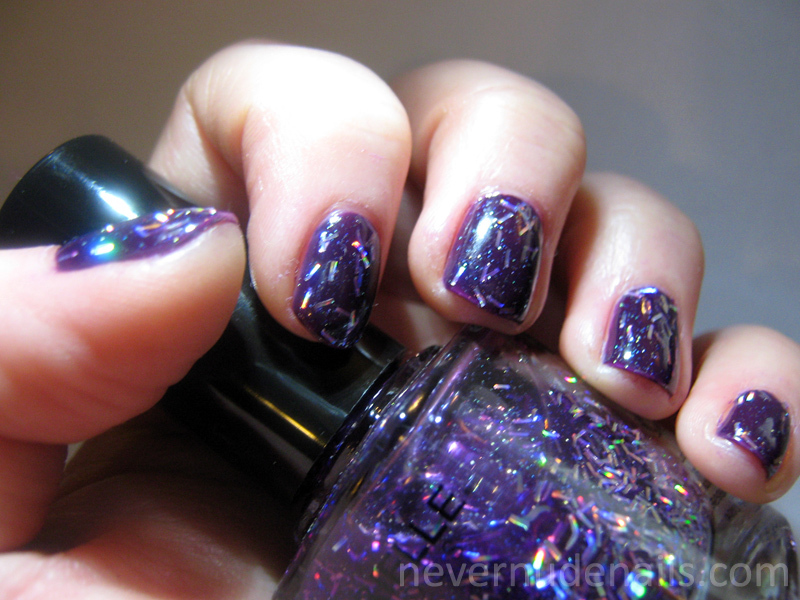 I layered two coats of Shannon's Attitude over two coats of Plum by e.l.f. Plum was a bit watery on the first coat but was fine with the second. One coat of Seche Vite to finish. Next time, I think I'll try a different color base color with this one and see how it looks. 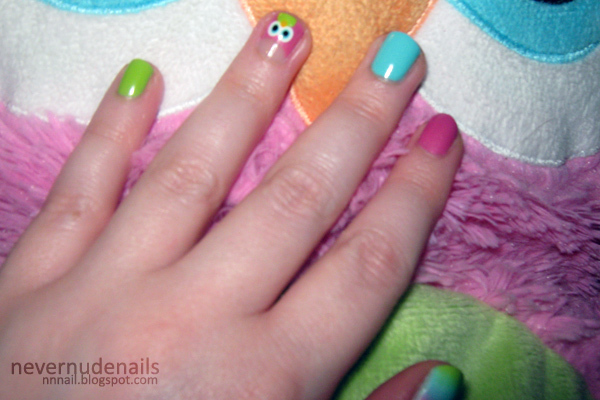 These nails were inspired by a pillow for kids I found at Walmart. Its official name is "Baby Boom Owl Plush Pillow" but I call it "Big Owl" because it's a big owl and it's like Big Al's where we shopped for fish supplies. For the thumb, I did a gradient of the pink, blue and green polishes. 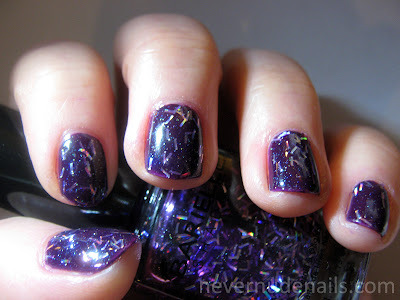 All nails topped with Seche Vite. 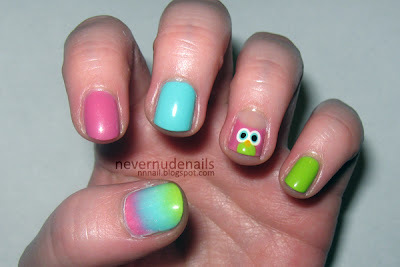 I'm entering this in Sincerely Stephanie's Skittle nail art contest! Yay! Gradient with NYC Purple Pizzazz Frost and East Village. 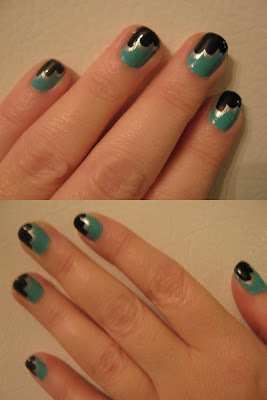 "Clouds" with Wet N Wild I Need a Refresh-mint, NYC Tribeca Silver and Black Lace Creme. I actually loved this one. I used a tutorial from Nailside (Tutorial: Freehand cloud design). I went to Walmart after finishing this and the lady ringing us up grabbed my hand and asked if I did it myself. NYC Black Lace Creme and Pure Ice Busted. 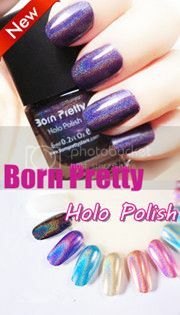 NYC Black Lace Creme, Sally Hansen Brisk Blue, Wet N Wild Through the Grapevine, China Glaze Dorothy Who? I think I was attempting to do Galaxy nails with the one above but forgot to add some white in there. Oops.